This week in the MIAMI REAL ESTATE SHOW, Orlando Montiel interviews the CEO and Commercial Division Director of Fortune International Realty, Fabio Faerman also President and CEO of FA Commercial. 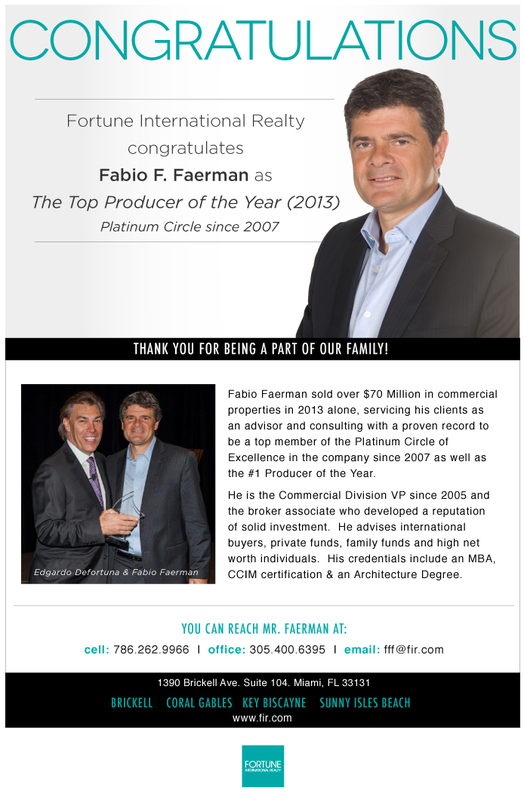 Mr. Faerman has consistently contributed to the progress of Miami’s commercial real estate market by acting as a broker/consultant on deals such as the Big Fish Riverfront Land, 999 Brickell, Neo Vertika, and One Flagler, among others. Received Fortune’s Platinum Circle Award, continuing to be the number one Top Producer in the company. Have sold over $100 million in commercial properties, E.G Cipriani restaurant in Brickell. Certified Commercial Investment Member CCIM. How to become a successful commercial real estate agent. Different types of commercial properties you can specialize on. Difference between Commercial/Residential real estate. The importance of Education, and its role in the Commercial Division.